All downloads are for individual personal use only, and may not be used for commercial or for-profit activities. You may print out as many as physical copies of my templates as you like for your individual use, but may not use any part of my downloads in other products. This means do not distribute my templates to other individuals, package them with other downloadable planner templates, or sell them through Etsy or other online platforms. In other words, DON’T BE A JERK. PDF downloads are non-editable, have the fonts embedded in the document, and the contents will not change with your margins or resolution or printer settings. What you see is exactly what will print. These pages were designed to be printed on 8.5 x 11 paper in landscape mode. The pages are meant to be printed double-sided, and then cut in half and punched with a Levenger/Arc punch. 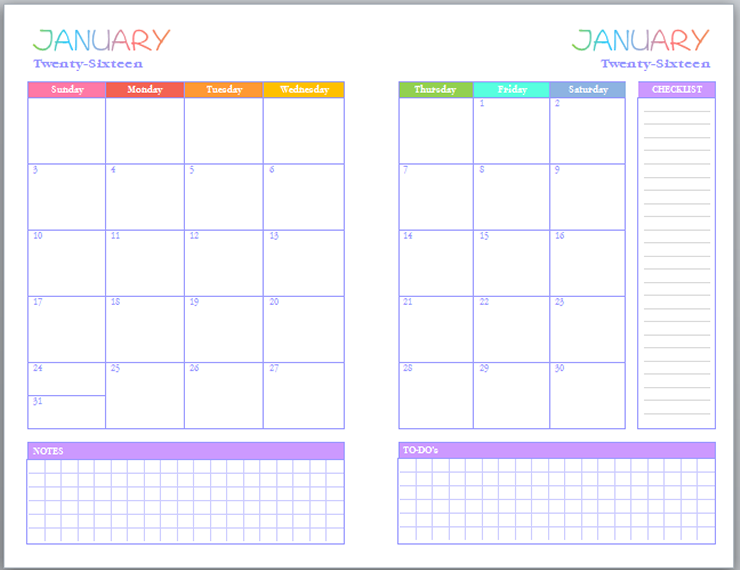 Each month or week will be a two-page spread, so you will see both pages of a month or week at one time when the notebook is opened. Because of this setup, it may look like the dates are out of order when scrolling through the PDF. This is deliberate, and not a mistake – necessary in order for the right month or week to start on the back side of the last month. If it helps open the PDF and zoom out til you see 2 landscape pages per screen. If you look at the dates you will see they follow the logic above. Still confused? Check out this post for screenshots illustrating this principle. If you have a color printer that prints double-sided pages (or are using the black and white version), then this means you have to choose double-sided printing from the print menu, and then choose to print on the short side (or long side, if that’s how your printer works). This might take some experimenting. If your color printer requires you to print manual double-sided, it’s more work. You physically print on one side, go to the printer, take them out, reverse the order, and place them upside down back in the tray or however it works for you. On my printer, this means I have to print all the odd pages first, then once I’ve placed them back in the tray I print the even pages. 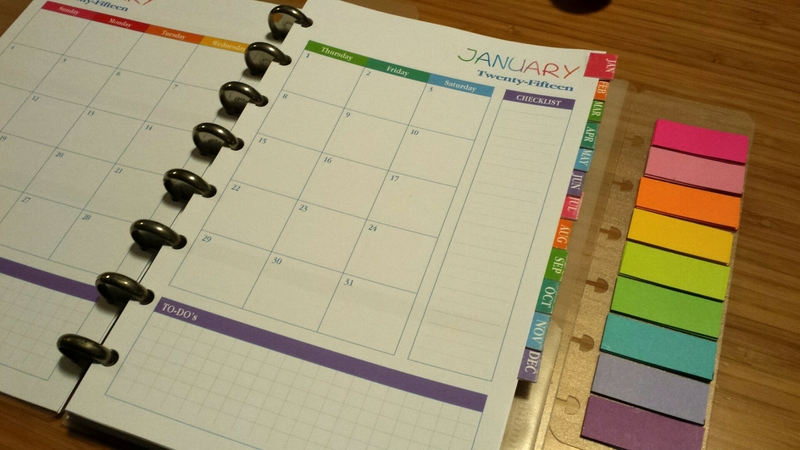 It’s complicated, but hey – that’s what you get with DIY Planners. Enjoy! Download via MediaFireSame version but with hours from 6-4. 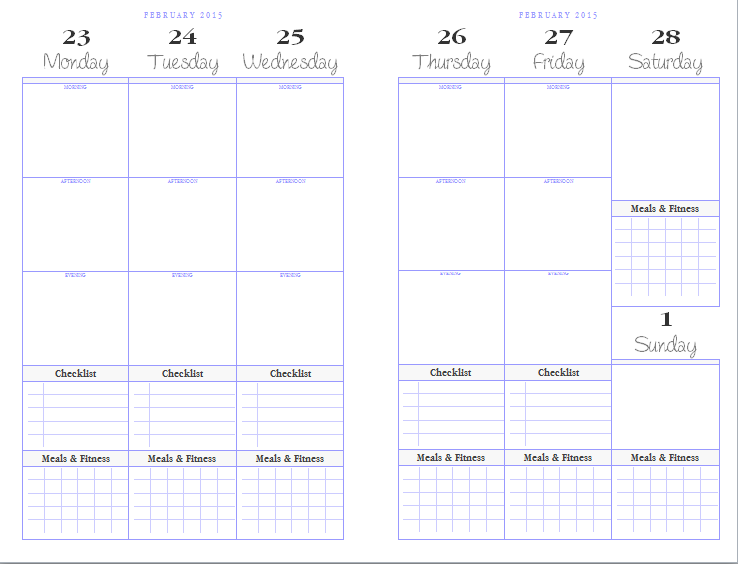 Version A2 – same except for notes section is bigger to replace meals tracker. how about a lunar calendar to keep up with the moon changes? I’ll add it to the ideas list, thanks! 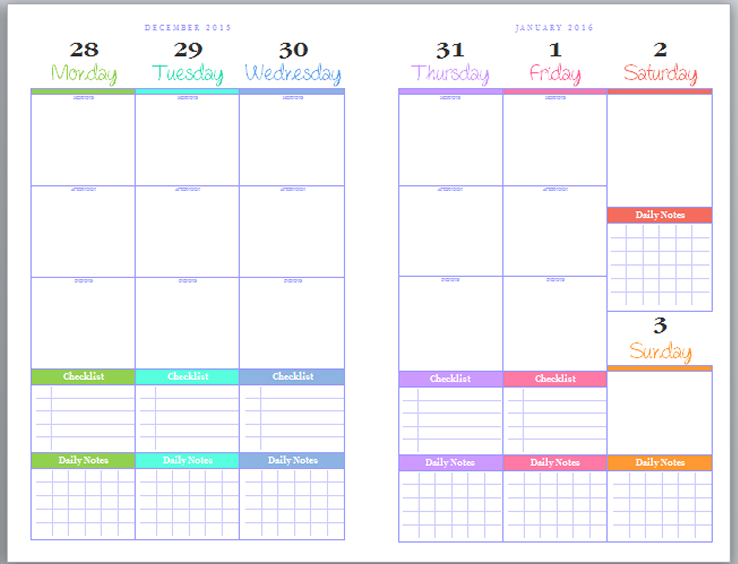 I love your planners, and I can’t go without starting the new year without your delightful junior horizontal pretty planner; love those colors! Shame on those who profit on the labor of others. I am a firm believer of what comes around goes around. 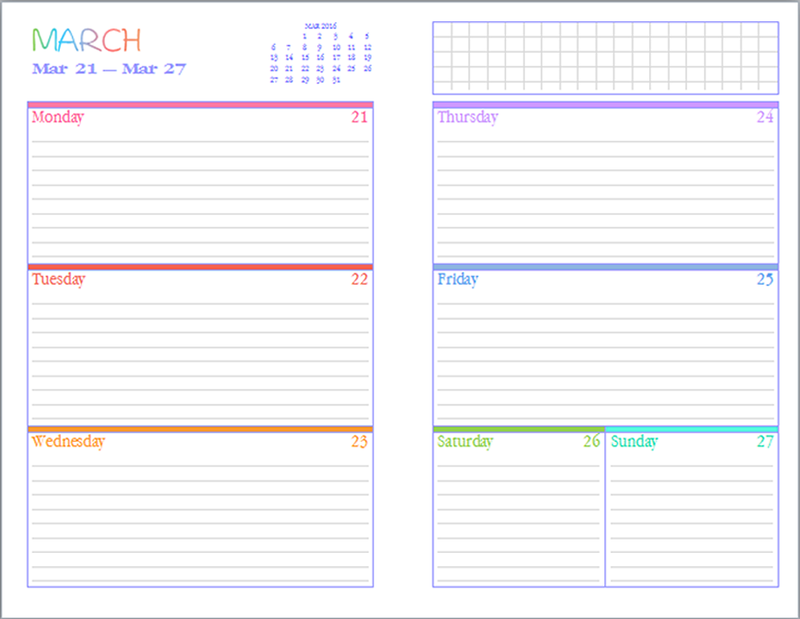 Your generosity of sharing your wonderful planner will be rewarded. Thank you so much and Happy New Year!!! 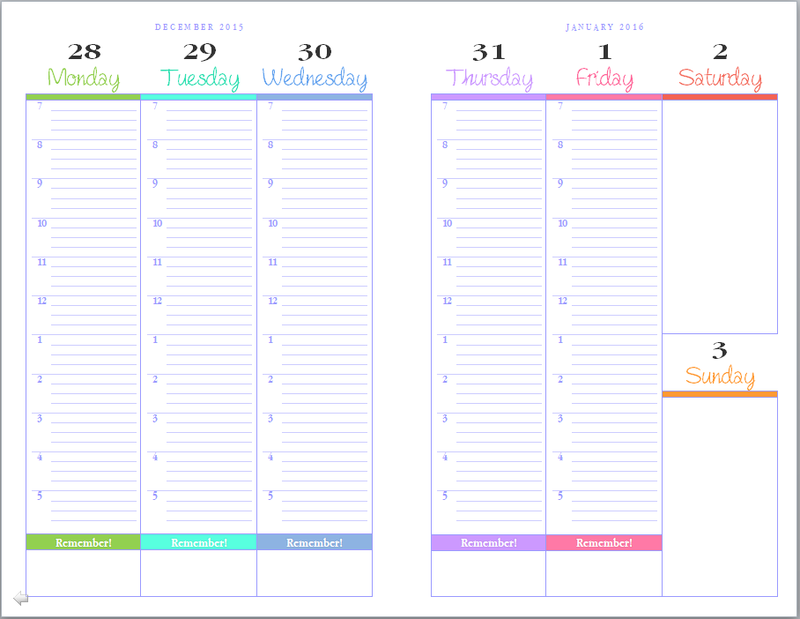 Hello,, Thank you for the use of your beautiful calendars! I am trying to print mine and it says I need a password to print. Do you have one I could use please? Thank You. Hi Denise! Sorry for the delay in getting back to you! Unfortunately I have had such issues lately with people stealing and reselling my templates, I’ve had to really lock down my 2018 templates. It doesn’t require a password to open or to print, but anything else is locked down. I haven’t posted the password anywhere, and won’t be allowing any other edits. If you are having issues just opening and printing though, which you should be able to do regardless of the password, it may be a software version issue. These PDFs are designed for Adobe Reader X, so any version older than that might not work as planned. The newest version of Adobe Acrobat Reader is free to download from their website. If using other PDF readers, make sure they can read Adobe X compatible documents. I’m sorry for the inconvenience or annoyance this may cause! Your Pretty Pretty Planner (junior) is such a joy to me! I LOVE COLORS! They make me happy! Being happy is difficult on many days, since I have multiple health issues that I need to be logging… and I hate logging (yet it’s crucial). Now I can be ‘HAPPY’ while I log!!! Thank you and may God bless your efforts exponentially! Awww, thank you! 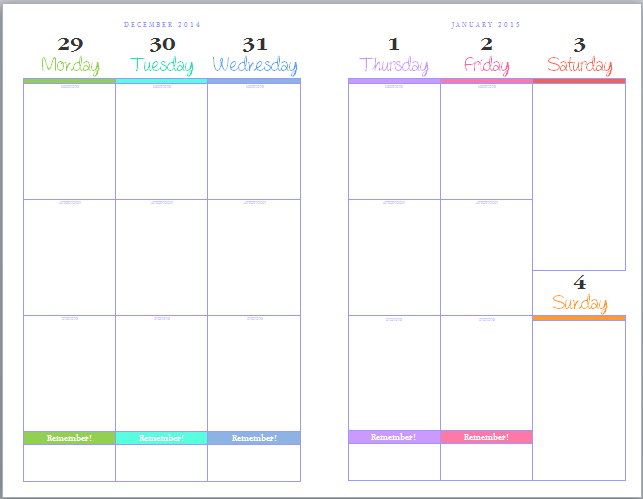 That’s why I made it back in the beginning too – I love colors and also need lots of white space to plan in, and just couldn’t find that combination anywhere else. So glad you like it too!! Can I just say “You rock!!!” ? 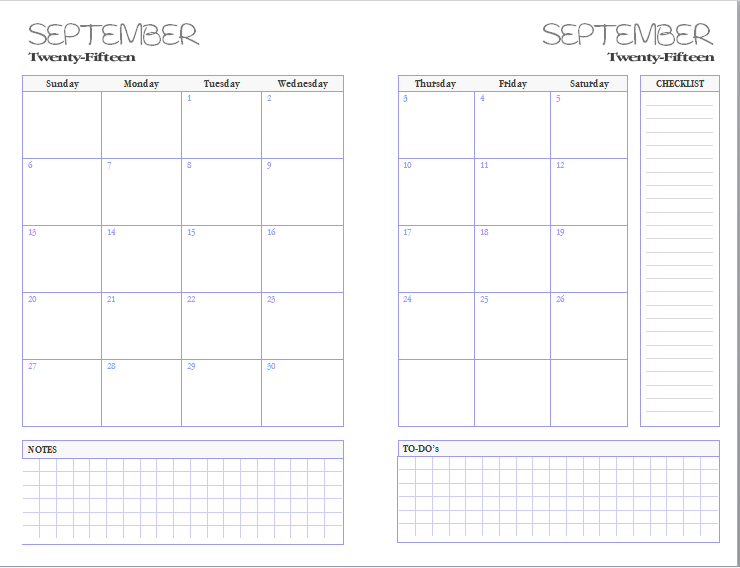 I was looking to create my own planner pages (1 week across 2 half pages) and lo and behold I found your site. Thank you so so much! I’m not super tech-wise, but am assuming you don’t have this in a “editable” format? The reason I ask is because I love your hourly format, but love the checklist and daily notes at the bottom of the “block” format. I honestly only need 2 lines per hour (so 30 minute slots), and would love for the hours to go later . . . all that to say that I would make it from either 6 am to 9pm, or 7am to 10pm and then have the checklist at and daily notes at the bottom. Again, so amazing that I found this and that you make this available – thank you! I will use it as such (still trying to decide which format of the two I prefer) but thought I’d ask! She used to put out an editable version. Then people started using it and calling it theirs. It’s pretty awful, so now she can’t take that chance. Yes, they are now available to download! Thank you for your all your time and effort in making these. Really appreciate it. Thanks so much! Thank you for your patience in waiting for them!! I am always so excited when you announce the new planners will be available. Thank you for your incredible effort and creativity! These are so beautiful, but please please please can you do the black and white versions of the Junior and Letter sized planners? I was patiently waiting for them since October! Thank You for sharing your hard work!!!! Hello, I was able to download this file, JNR_PPP2019 (7 days, Monday start, includes monthly calendars) and I realized after I printed that it was missing May 23rd, Its my anniversary so I kinda need it LOL, hubby will be upset If I forgot, but if its missing from my calendar all together than I may just get away with it. Honestly any other date I wouldst have noticed, Can you post an update? thanks again for making these available to all of us. because of how the order must be for it to print correctly. But I do see it in the file, and the date reflects the file correction I posted.